This is a very tricky and touchy subject. 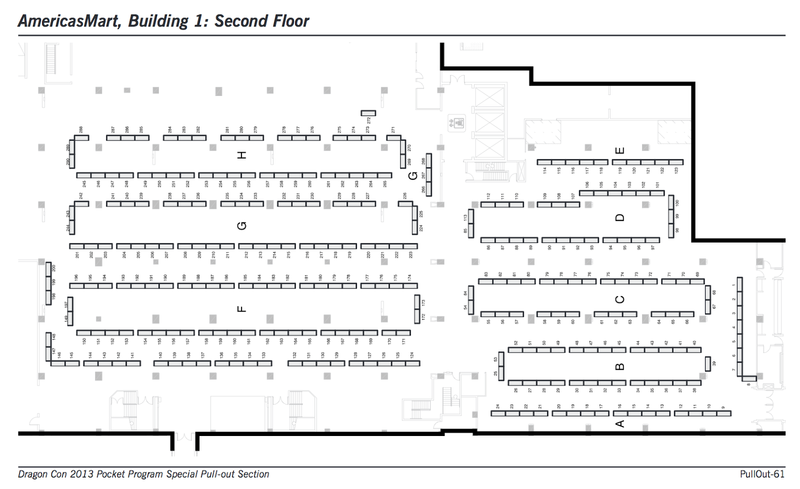 The Dealers room or Vendors hall. This area of conversation is sure to piss some people off. Many years ago the Dealers Room a.k.a. 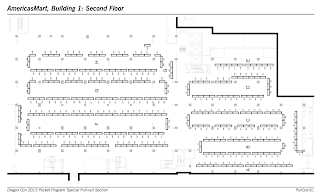 Vendors Hall was located on 2 floors of the Marriott in 3 different rooms. It was crazy, crowded, smelly and generally not a fun place to go. Back in 2013 the powers that be moved this over to America's Mart which is across the street from Peachtree Center and next door to the Westin. I know why it was moved...durrh, we had outgrown the space at the Marriott. I get it, I really do. This does not mean I have to like it. I have massive crowd issues and I hate to be in large crowds. I would endure the Vendors Hall because I had to if I wanted to purchase some merchandise. I liked that it was in the Marriott because I could make a quick trip in there in between panels and shop then leave and come back and do another section later. I liked that and I only had to deal with the crowds for short spurts. Since the move to America's Mart the poo has hit the fan with the congoers. 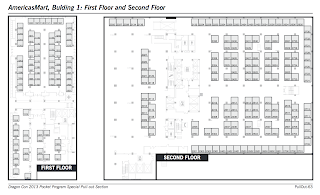 The space at A.M. is very oddly shaped and we were on two floors and in different rooms on the same floor. There was not a way to effectively direct traffic and once in the rooms it was oh so difficult to find the vendor you were looking for. Once you got into the depths it took FOREVER to find you way out again. This does NOT help my crowd anxiety. Even when I knew where I was going (per the map) I got lost both on the way in and the way out. Instead of a quick trip like I had to deal with at the Marriott, now it was an hour of planned time and it was hell. Things got so bad that Marc would not even go in last year. I only did because I had to. Our tee shirt supply was getting dangerously low. I do not know how many times the Fire Marshall shut the place down for being over crowded. It was total, complete chaos. A NIGHTMARE for people with crowd anxiety. I know you are thinking, "If you have this bad of crowd issues why do you even bother going to con at all?" 1) I love my people and this is the only time I get to be with them. 2) The rest of the con the issues are manageable. I go into panel rooms or bathrooms or something so the crowds are not pressing in my face. Besides the issues are only when I go into the common areas. I only have to go into the common areas once per hour. See not so bad. This year the powers that be say that things have changed in America's Mart. No longer are we going to be in Building 1 we will be moving to another building all together. I think it is building 2 but do not quote me on that one. 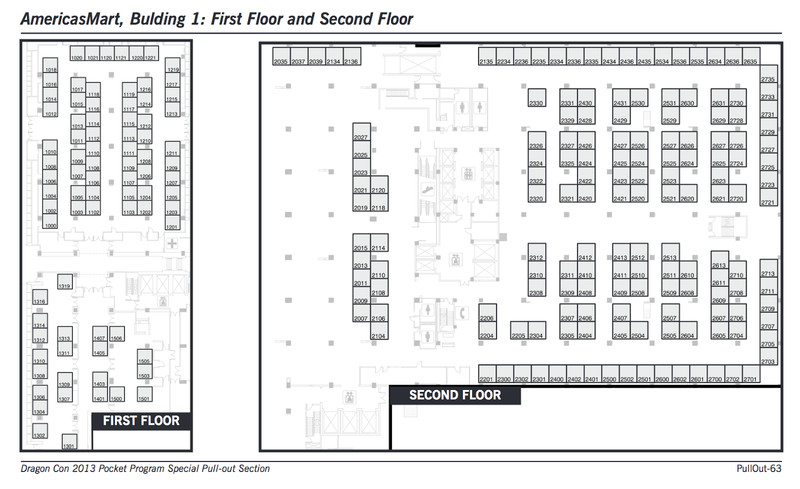 Supposedly we will be in one ginormous room with all of the vendors so there is no getting lost in weirdly shaped rooms. All I can do is hope that the hell of shopping will be made easier this year. Here is to hoping. First floor and first room on second floor.